With lax public awareness and limited police enforcement, towing operators need to take precautions. These cover a range of actions to keep the threat level to a minimum. “Towing operators need to ramp up advanced warning,” Sullivan says, though he acknowledges that at incident scenes there is limited time and manpower in the early stages. “In the first 10 minutes of an incident, everyone has their hands full — law enforcement, fire departments and tow operators.” But when time and manpower permit, advanced warning signage could add a level of protection. High-visibility gear can serve the same purpose not only for the operator but for the tow truck as well. Sullivan suggests tow operators borrow a tactic of fire departments and state DOT agencies — adding warning chevrons to the rear of tow trucks. He recommends mimicking the design used by fire services. “The pattern the fire service uses is best — lime green, red, orange,” Sullivan says. But whatever colors are used, the most important feature is the pattern should be both fluorescent and reflective. Naturally, some roadside locations are more dangerous than others, and call for extra precautions. 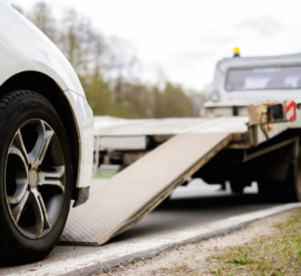 Vehicle breakdowns sometimes involve tire changes, a particularly dangerous task. “Don’t do tire changes in traffic.” Godwin says, a suggestion that is seconded by WreckMaster’s Justin Cruse. “Operator safety is No. 1. We’re 100 percent behind the Tow First campaign (http://www.thenata.com/towfirst.html.). As an industry, we should adopt that policy.” Cruse is president of WreckMaster and has been involved in the development and presentation of the WreckMaster training program since 1997. WreckMaster has trained over 40,000 towing and recovery operators since 1991. When towing operators are on the roadside, they need to be seen. That’s where lighting comes in. How much and what color can be a controversial topic. It is generally agreed upon that for oncoming motorists, lighting should have the proper mix of intensity and direction. “New LED warning lights can be too bright, too intense,” Sullivan says. “Emergency lighting companies now offer features to switch from high to low power.” Be aware that raised flatbeds can shield emergency lights from the motorists’ view, and work lights aimed toward the oncoming traffic can look like headlights headed in motorists’ direction, he notes.